Relax and roll in pamper at the Hilton Phuket resort where recreation is redefined by its inspiring spa, refreshing pools, and thrilling water sports. This is where recreation means loosely unwinding followed after strictly adventuring. Go for a free diving class, chill down at any of its swimming pools, get pamper by a traditional Thai massage, become a local at its one of the restaurant, or simply recline and listen to the rhythm of the waterfalls. Established on the Karon beach dunes, the Hilton Phuket expands on the acres of tropical greens as an astounding resort as well as spa. 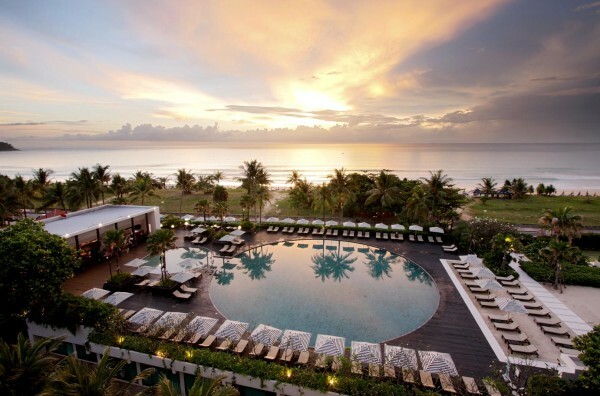 Rising from amidst the swaying palms, silky sands, and a landscape of tropical flowers, this resort acts as a small heaven for golf fans, divers, and spa lovers who love to experience a calming herbal treatment in the spa covered by the groves of coconut. For the business class, nothing lacks here with its meeting rooms, Internet, and related services. In addition, the resort is very close to some of the best attractions such as the Chalong Temple, Kata Yai as well as Kata Noi Beach, and Fantasea Theme Park all of which being at a short drive locations. At the Hilton Arcadia Phuket Resort and Spa, there are 676 rooms in 7 towers of 12 floors all having balconies for spectacular vistas. Among the standard amenities, you can expect high-speed Internet access, pay movies, separate sitting area, curtains, AC, voice mail, Internet access (surcharge), mini bar, refrigerator, coffee/tea maker, wake-up calls, hair dryer, bathrobes, complimentary toiletries, in-room childcare (surcharge), electronic/magnetic keys, desk, clock radio, satellite television service, TV, opening window, iron/ironing board (on request), cribs, and rollaway beds. At the Hilton Phuket, you enjoy the popular Hilton Breakfast daily, themed dinner buffets, all-day a la carte menu, and a memorable night featuring the pure Thai dishes prepared by the Master Chef. The Thai Thai Restaurant offers a memorable night dinner amidst its embellishments in form of modern Thai art. This is where you enjoy the finest Thai dishes of the Master Chef. Other highlight is the view of the rising moon from the Andaman, which is possible at its terrace lit with candles. Offering the Traditional Thai cuisine, this is open daily except Sunday until 10 pm. Caffè Cino is the pure café style eatery offering you delicious snacks like fresh salads as well as sandwiches. This operates daily from morning 7 to evening 7 and facilitates watching of the other guests around the pool. Sails Restaurant is the home of the celebrated Hilton breakfast, all-day à la carte menu, and themed buffets at night. Either you choose the buffet or go for the delicacies of Asia as well as the Mediterranean here. However, there is not option in watching the swimming pool at all! So, come here, if you want to enjoy Thai or International cuisine in a relaxed ambiance. And yes, it also serves kids’ menu for those between 5 and 12 years who can savor buffet at half the price. This one is open daily from morning 6 to night 11:30. Buon Appetito is a stylish restaurant for those who want to dine at the outdoor patio with the great vistas of the lagoon. Here, you savor Italian dishes daily.